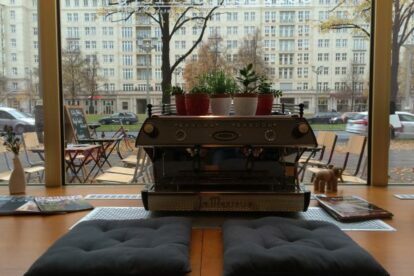 For any coffee lover out there -especially for those of us who live in the Karl Marx Allee area in Friedrichshain- Coffee Profilers has been a real treat in the specialty coffee goody bag. Not only is it nestled in a beautiful eastern block building in the once called Stalin Allee, but the atmosphere inside is precisely what one would want a small café to be: classy, relaxing, just the right space to think, read, write, chat or simply savor the black concoction that will have been brewed especially for you. But even though those are definitely highlights, they’re not really the best part. The best part is that if you really want to talk about good coffee, these guys know what they’re doing. They are some of the most approachable and knowledgeable coffee makers I have met. Choose your method: Syphon, espresso, filter and try one, or even two of the many blends of coffee they have available. They’re also no novices when it comes to dessert and snacks, so keep an eye out for magically-appearing homemade jams and pastries. Mix that with passionate baristas -I am talking truly dedicated guys, really- and voilà, one of the best coffee experiences you will ever have.